Is South Africa trading wildlife products under the guise of Traditional Chinese Medicine with NO medicinal value? South Africa has engaged in an increasing commercial trade in lion bones from their canned hunting/captive breeding programmes. The trade flows mainly to Laos and Vietnam, where such lion bones are thought to have commercial value for a “traditional medicine” trade. Some lion bone shipments are also sent to China. Indeed, there are established “bone traders” in Johannesburg and Cape Town in South to facilitate the shipments. They conduct their “business” via the captive lion breeders, hunting operators and taxidermists. 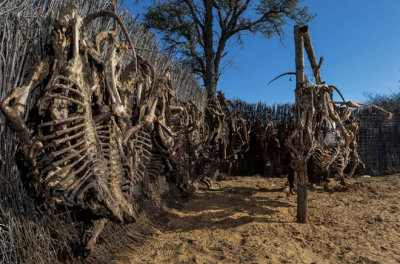 All approved by CITES, this lion bone trade from South Africa has meanwhile established a poaching trend for those wild lions remaining on the continent. Bones are valuable – a skeleton shown in the picture above can achieve $75,000 when “rendered”. A skeleton bought in South Africa these days fetches between $1,500 to $2,000. A massive markup in other words. This trade should cease immediately. It is a FALSE product promoted by commercial interests rather than having any medicinal value and no further CITES permits should be issued. Recently, I interviewed Tianjun Wang PhD, MBAcC, FMATCM, FHEA. Dr Wang graduated from Nanjing University of Chinese Medicine in 1989 and worked as a medical doctor and acupuncturist in a Chinese general hospital for 18 years. He is now a leading practitioner in Traditional Chinese Medicine (TCM) in the UK and a senior lecturer at the University of East London. “Lion and tiger bones were used in the past as they were incorrectly thought to be a benefit for arthritis and similar conditions. This use is regarded as 'old fashioned' and a practitioner would not entertain these ingredients in modern TCM, as there are effective herbal medicines used to treat these conditions. The use of lion and tiger bones is against the law in China. There are many herbal choices available and no respected or registered practitioner would use either in medical treatments. So South Africa wants to trade in rhino horn with no medicinal value and lion bone with no medicinal value under the guise of benefiting Asian medicine? Think again. It is all based on false assumptions.